In 1981 I'm on a bicycle ride on the C and O Canal paralleling the Potomac River in Washington DC. As I'm riding towards Georgetown, I'm about to reach Fletcher's boathouse. Suddenly I hear the throaty sound of a steam whistle. The railroad line running by Fetchers has been abandoned for years so I think that I'm hearing things. Then in the distance I perceive the unmistakable rhythmic sound a laboring steam engine coming up the tracks from Georgetown. "Shi, shh shh shh. Shi, shh shh shh." I stop my bike in the middle of the C and O Canal towpath at Fletchers and look over towards the boathouse. I see a group of musicians dressed in traditional 19th Century period garb. They are tuning their instruments getting ready to play. I look down the tracks that run parallel to the Canal. Then in the distance I see a shiny antique locomotive steaming towards me. The hissing sound seems to be mimicking the words from an old children's story, "I think I can, I think I can." As the train reaches the boathouse, the old wheezing locomotive is badly leaking steam and hot water. Clearly this shiny artifact of times past is more at home drawing appreciative stares in the Smithsonian Museum. This shiny relic of a bygone era is the last train ever to grace the tracks from Georgetown to Bethesda. The spur had only recently been abandoned by the CSX railways due to a lack of business. The arrival the John Bull locomotive also signals impending change. After decades of neglect the train tracks are to be removed to make way for the creation of the Capital Crescent Trail. In the ensuing years I watch intently as the trail is made ready for bicycles and pedestrians. 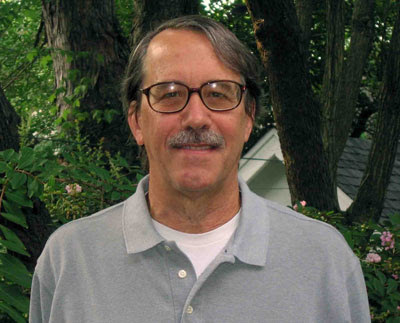 I become a donor for the Rails to Trails project. In return I receive a steel railroad spike with the inscription "1910 Capital Crescent Trail 1993." Finally in 1996 a formal dedication declares the path completed for the entire length from Georgetown to Bethesda. The new Rails to Trails bicycle thoroughfare is open for business. Bicyclists and pedestrians replace trains that once ferried coal to a power plant in Georgetown. The Capital Crescent Trail becomes my primary commuting route to my workplace, the World Bank. I access the trail from a parallel spur called the Little Falls Hiker Biker Trail, which runs through the woods along a stream. The Little Falls trail is more like a community park with friendly dog walkers and bicyclists greeting each other, saying "Hello, how are you?" "Nice day for a ride." On this meandering path the bicycles go slow and pedestrians amble along enjoying the sights and sounds of Little Falls Stream as it brushes clean rocks and boulders on its way into the Potomac River. In this idyllic setting there is little conflict between walkers and cyclists. Recently on a summer weekday I turn from Little Falls trail onto the Capital Crescent trail and head for Georgetown. The friendly atmosphere of Little Falls is replaced with formality. Even on this sunny afternoon I see some brightly colored riders with a sense of freedom speeding towards work. Most are focused on riding fast and getting from here to there with no time for pleasantries. Once at their destination, the grey suits come out of their packs and they join masses blending into the workforce in the nation's capital. Now retired I can relax and enjoy scenery, take long breaks and appreciate the local history. I'm sitting very near Battery Bailey (now Westmoreland Hills Park), an old Civil War placement for cannons. North of me the trail blazes a path through history. Near Silver Spring the unfinished trail cuts through a point from which the US Capital was attacked during the Civil War. 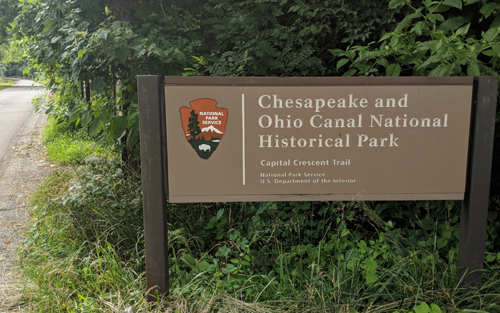 In July 1864 10,000 confederate troops commanded by General Jubal Early rested on what is now an unpaved portion of the Capital Crescent Trail. Early's troops were exhausted from a long day's march, so he ordered them to rest on a location near the trail. The next morning after a probe of the defenses, General Early sensed that an attack was futile. He withdrew from the field of battle and left the future site of the Capital Crescent trail. Little did he know that one of the heads sticking up over a parapet in Fort Stevens viewing the skirmish was none other than Abraham Lincoln. The only threat to the capital during the war was over, but this probe of the Union front line resulted in about 400 dead or wounded for each side. Riding towards the Dalecarlia Tunnel on the Capital Crescent trail I quickly encounter the massive Roman arches of the Dalecarlia Tunnel with the inscription "Dalecarlia 1910." The 400 foot long tunnel originally was built to go under Dalecarlia Road as part of Georgetown Branch of the Baltimore and Ohio Railroad. As I enter the well lighted tunnel I hear dripping water and the air is refreshingly cool on a warm summer afternoon. It's late afternoon with people beginning to trickle home on the trail. To satisfy my sociology curiosity, I decide to count the riders. I see a variety of two wheel vehicle, including road and mountain bikes, several recumbents (rider is horizontal), a bipedal (similar to a stair stepper) and one arm peddler (turning cranks attached to handlebar). In just 20 minutes I count 100 bicycles, so that's 300 bicycles an hour. Doing a bit of mental math, this means close to 1 million bicycle trips each year. With the Potomac River on my right I race down the trail to Georgetown. The river is filled with synchronous crew boats hulls skimming the water. The Washington Monument rises above the Key Bridge, pointing towards the sky. I pass through Waterfront Park and stop for a rest on the edge of Washington Harbour. Tours boats are coming and going. People are bustling about. Flags are flying. I feel the unity of a city even though it's divided by fast running river currents. After I rest in Georgetown I join the steady stream of commuters heading home towards Bethesda happy to have their own bicycle superhighway, keeping away from motor traffic. For every bicycle on the trail, it means one less car on crowded city streets. The Capital Crescent Trail has come a long way since those early days when the John Bull steam engine hissed up the tracks for the last time. Seven miles of the trail is paved from Georgetown to Bethesda. Six additional miles are very rideable crushed stone that extends from Bethesda to Silver Spring. 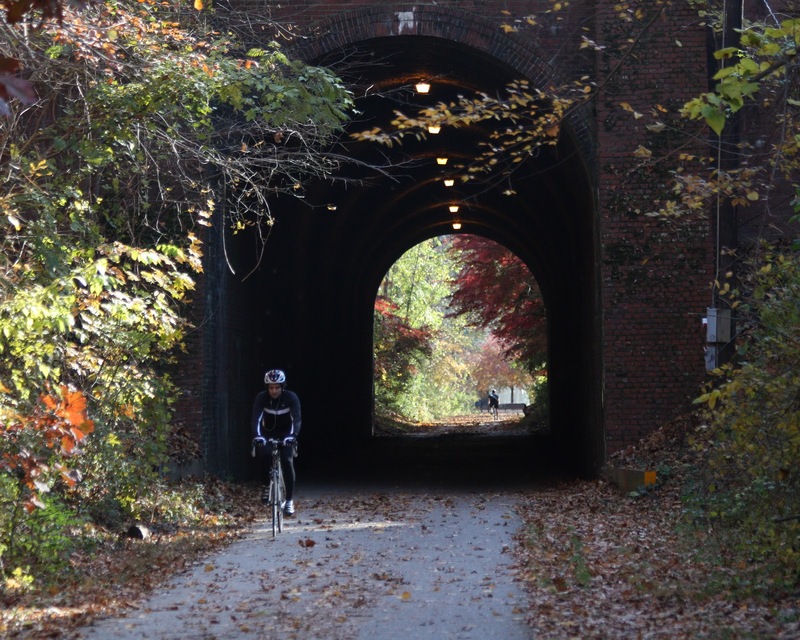 Highlights are a railroad bridge over Canal Road, the Dalecarlia Tunnel under MacArthur Boulevard, another tunnel under Wisconsin Avenue and a bicycle trestle over Rock Creek Park. Maps of the trail are available from the Coalition for the Capital Crescent Trail. Today the Washington, DC portion of the trail which is managed by the National Park Service is badly in need of resurfacing. This portion of the trail has suffered from cracking and root bulges. This time around the National Park Service should do it right, taking care to eliminate possible damage from tree roots, water runoff and other problems that have caused buckling the pavement over the years on the existing trail. The trail carries heavy bicycle and pedestrian traffic, so it should also be widened and provided with shoulders for walking as was recently done in Maryland.